Tomorrow is the season opener of the Thursday night Peabody rooftop parties. The Molly Ringwalds, who cover all the musical genres of the 1980s, will keep you entertained. $15 general admission, $30 VIP admission with ladies and hotel guests free before 7 PM. Admission includes a buffet of chicken drummies with honey BBQ sauce and celery and carrots with Fiesta Ranch dip. If you’re in VIP you get a second buffet of lamb on a spit, stuffed grape leaves, spanakopita, and baklava. If you plan on coming to a lot of these parties in 2018, it’s a good idea to go ahead and purchase the season-long VIP pass for $150. That gets you into all the parties including the VIP section, and it gets you discounts at the Peabody restaurants and valet parking. The Peabody’s restaurant Chez Philippe and Memphis in May will present a Cuisine of the Czech Republic experience May 12 from 6 to 10 PM. Czech chef, best-selling author, TV personality and entrepreneur Zdeněk Pohlreich will prepare a five-course dinner of cuisine from this year’s Memphis in May honored country. The Center for Southern Literary Arts will present the 1st Annual Memphis Literary Arts Festival in The Edge District Friday-Saturday, June 15-16. That Friday there will be a Dinner in the Hibiscus Ballroom, an MLAF benefit featuring D. Arthur (chef), Kiese Laymon (author), Ada Victoria (musician), and Andrea Morales (photographer). Tickets are $85 general and $250 VIP. Saturday there will be a street fair, free to attend, on Monroe Avenue between Orleans and Madison 9 AM-5 PM. There will be appearances by authors and artists Kiese Laymon, Eloisa Amezcua, Hanif Abdurraqib, Sam Sax, Jenny Johnson, Kaitlyn Greenidge, Alice Bolin, Heather Dobbins, Alice Faye Duncan, Andrea Morales, Siphne Aaye, Arthur Flowers, Maurice Carlos Ruffin, Christina Oliveras, Osayi Endolyn, Ashanté M. Reese, and more to be announced. Readings, conversations, and performances in the Premiere Palace Ballroom and Marshall Arts Gallery. After-party at Premiere Palace 7:30-10 PM with DJ Siphne Aaye. First 100 drinks at the after-party are on the CSLA. Fridays will be Free Stuff Fridays at the Redbirds this season. Every inning, prizes will be given away, and one fan will be selected to roll a pair of giant dice for the chance to win $10,000. If they don’t win, the prize rolls over to become $20,000 the next Friday there’s a game. Downtown Candle Co. is having a 3 for $35 online sale today. If you buy at least 6 candles you’ll be entered into a drawing to win $100 worth of candles. 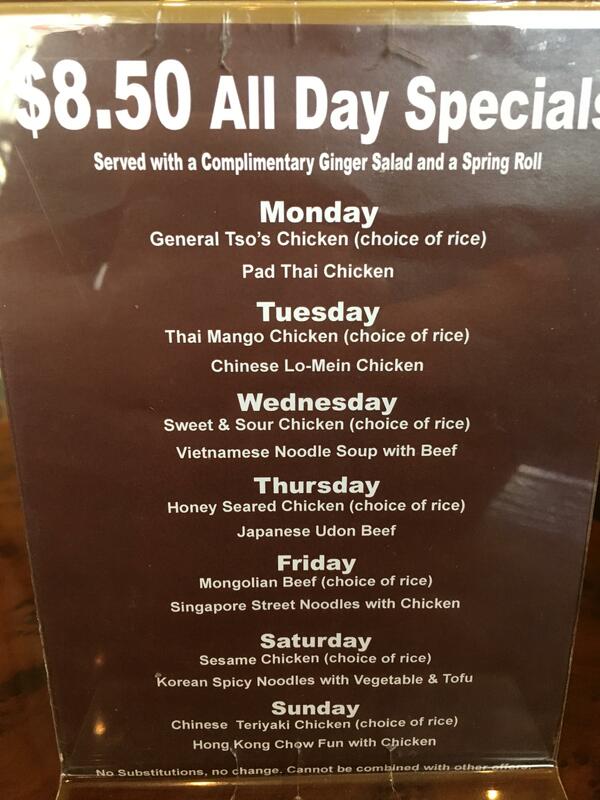 For lunch yesterday I tried Noodles Asian Bistro on Poplar, just east of Exeter in Germantown, for the first time. There were several dishes on the menu I wanted to try, finally settling on the Korean Spicy Seafood Noodles. 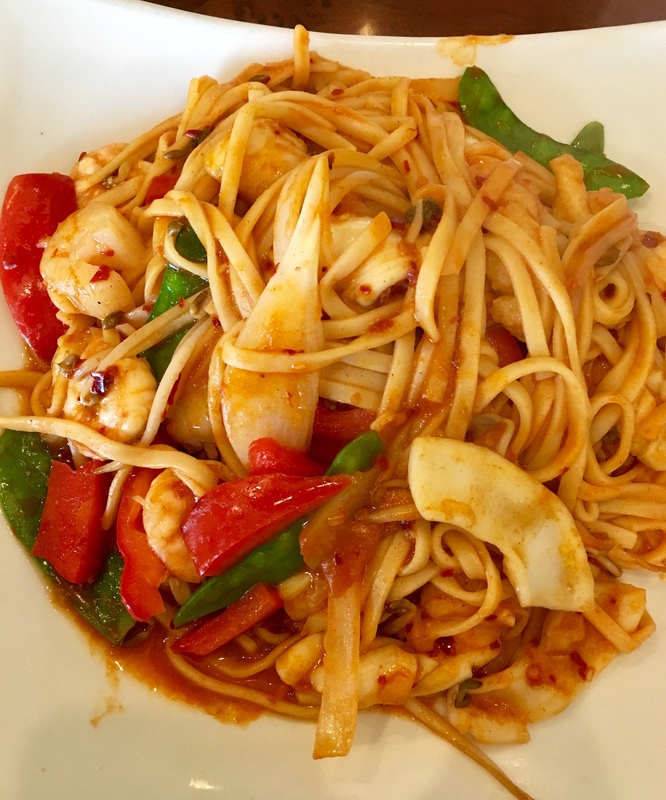 These are egg noodles tossed in a wok with shrimp, scallops, calamari, snow peas, sweet peppers, bean sprouts, cilantro, and Korean spicy sauce. They asked if I wanted the noodles mild, medium or hot, and I paused for a second here. Hot is my default value because I love spicy food, but in some Asian restaurants they can turn up the heat to tongue-scorching levels. “Well, if that happens, it’ll be a mistake I only make once,” I thought. The noodles came out with a spring roll on the side. They were delicious and just the right degree of hot (but remember, I like spicy; if you don’t you might want to stick to medium or mild). There was an abundance of seafood, and the sweet sauce that came with the spring roll was a nice counterpoint to the heat of my entree. With a $2 Coke and tax, I was out of there for $13.99. Noodles has earned a spot in my first tier of lunch restaurants. I plan on coming back for their basil fried rice, Pad Thai, Dan Dan Noodles, and Vietnamese noodle soup. Speaker of the House Paul Ryan has announced he’s not going to run for re-election. Wait, I don’t get it. The Republicans have control of both houses of Congress, a puppet in the White House who’ll push their agenda, Gorusch on the Supreme Court… the 2019-20 Congressional term could be the GOP’s opportunity to shape America in its vision. Why wouldn’t Speaker Ryan want to be a part of that? He could go down as one of history’s greatest Republican legislators. You don’t suppose… the FBI raid on Trump lawyer Michael Cohen’s home, office and hotel room has anything to do with this? Naaahhh… I’m just being a conspiracy theorist. Maybe Ryan is been bullied into not running for his seat… could be someone named RICO coming after him. That’ll do it for now. Back tomorrow.